Beyond debates about Tim Tebow’s transcendental qualities, this has to be the second-most asked question in the NFL these days. New Orleans has scored 40 or more points in four straight games (and five of seven) and after demolishing one plucky upstart, Detroit, last week in the opening round of the NFL postseason. They will try to dispatch another surprise team, San Francisco, in the Divisional Round of the NFL playoffs this weekend. New Orleans will load up one of the most explosive offenses in NFL history and head on the road to face San Francisco. The teams will meet at 4:30 p.m. on Saturday at Candlestick Park. The Saints have been installed as a 3.5-point favorite in this game and the total is available at 47.5. Even if you are surprised by the actual numbers that the New Orleans offense has put up this year, it isn’t all that surprising that the Saints are still playing this late in January. The same, however, cannot be said for San Francisco. The 49ers have been one of the biggest surprises in the NFL this year and will be playing in the postseason for the first time since the Divisional Round in 2002. Rookie coach Jim Harbaugh has done an incredible job with this team this season and the 49ers are one of the toughest, most physical groups in the entire league. San Francisco boasts the No. 4 defense in football and the No. 2 scoring defense. The Niners have the league’s No. 1 rushing defense and they didn’t allow a touchdown on the ground until Week 16 of the regular season. This team has had a week to prepare and I’m sure they will be salivating at a chance to slow down Drew Brees and this explosive Saints attack. Offensively, Alex Smith may lead just the No. 29 passing offense in football. But he has been amazingly efficient and may have turned his career around under the tutelage of Harbaugh. Smith has thrown 17 touchdown passes to just five interceptions and has been excellent at leaning on the 49ers’ powerful rushing game this season. Home underdogs have gone 19-10 straight up and 20-8-1 against the spread in the NFL postseason. This is just the fifth time in the last 25 years in which there has been a home underdog in the Divisional Round of the postseason. The home teams are 2-2 SU and ATS and the last occurrence was in 1996. That year Carolina beat Dallas, 26-17, as a home puppy before falling in the NFC Title Game. These two teams met here last year, with New Orleans gutting out a 25-22 win. They kicked a field goal as time expired to escape with the victory. Brees and the Saints offense re-wrote the NFL record books this year and the Saints offense has weapons at every position. They also rely on a very experienced, veteran defense, the core of which guided the Saints to a Super Bowl title just two years ago. If the Saints do have a weakness – and they don’t have many – it has been their shaky play on the road over the past two years. All three of their losses this season came away from home and they were held nearly 10 points below their scoring average on grass this year. 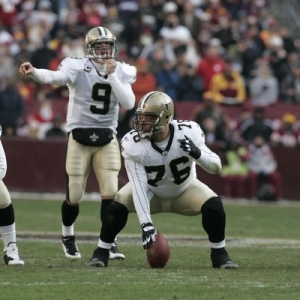 New Orleans saw its season end on the West Coast last year in Seattle and going back to 2009 they are just 7-13 ATS when they play away from home. New Orleans is a very rare road favorite in this week’s matchup according to NFL odds. The Las Vegas books opened with them as a three-point chalk while most of the offshore books had them as 3.5-point favorites. Over 70 percent of the early action has gone on the Saints and the line is now a solid 3.5 virtually everywhere. The total for this game opened at 46.5 but has since been bet up to 47.5. Nearly 70 percent of the betting in this game has come in on the ‘over’. The Saints have covered a remarkable nine straight games and they are just demolishing the sportsbooks. The Saints are 10-3 ATS in the last 13 meetings with the 49ers and they are 5-1 ATS in their last six trips to San Fran. The favorite is 5-2 when these teams play and New Orleans is 21-7-1 ATS in its last 29 games against a team with a winning record. San Francisco has been the best team in the NFL against the spread this year, going 13-3 ATS. They are 18-6-3 ATS in their last 27 home games and are 10-2-1 ATS in their last 13 conference games. The Niners are 3-0-1 ATS as a home underdog 10-4-1 ATS as an underdog of more than three points. However, the 49ers are just 1-4-1 ATS in their last six playoff games, even if their last postseason appearance was in 2002. In some ways this game reminds me a bit of the Denver-New England matchup in the AFC on the same day. In both instances we have one team that wants to throw the ball all over the field and turn the game into a shootout and one team that wants to run the ball, play good defense and turn the game into a grinder. In both instances the team that can dictate its tempo will have a decided advantage in terms of covering the point spread. I said on Day 1 that I felt that New Orleans had the best team in the NFL (mind you: this was when everyone and their sister was on the Philadelphia bandwagon) and they were my preseason Super Bowl pick. They have been playing out of their minds for the last two months and this is a very talented, experienced group heading West to face a San Francisco team that hasn’t been to the postseason in a decade. I don’t think I can bet against New Orleans right now. But as much as I like the Saints it is tough to get pinned against the public and jump on board a square favorite. Road favorites are rarely a strong play in the NFL, much less he postseason, as we saw with the Saints last year in Seattle (and Pittsburgh last Sunday in Denver). However, I think there is some value on the ‘under’ in this game because I do think that San Francisco’s defense will rise to the challenge in this game. I think that 47.5 points is too high and would play this one to finish with around 39-43 combined points.